Paul Binder was born in the Flatbush section of Brooklyn, New York on October 19, 1942. His father was the sales manager of a New York winery; his mother was a homemaker. Neither had much to do with show business, beyond the fact that Paul's father played the fiddle and conducted his own dance band for a time. Raised in Brooklyn, Paul went to Dartmouth College, where he performed as an actor with the Dartmouth Players and the Hopkins Center Repertory Theatre. After graduation, he spent a short time at Boston University's School of Fine and Applied Arts, then he worked as the stage manager for Julia Child's TV show, The French Chef. He would later work as a talent coordinator for TV producer and host Merv Griffin. Paul would eventually go to Columbia University, where he earned an MBA. But by then it was the late sixties, and like many young people of his generation, Paul had grown restless. He ended up in San Francisco, hotbed of the sixties' counterculture movement, performing with the San Francisco Mime Troupe—a political street theater using circus techniques to create metaphors. There Paul met his partner-to-be, Michael Christensen, and learned to juggle with Larry Pisoni, who would soon after create the grassroots Pickle Family Circus and trigger the New Circus movement in the United States. Christensen and Pisoni, who had a comedy-juggling act together, had decided to perform it on the street-corners of Europe. Pisoni bailed out at the last minute, and Michael offered Paul the opportunity to go in Pisoni's place. Their European journey took them from London to Istanbul, with a long stay in Paris on the way back from Turkey. In Paris, their street juggling act—a mixture of passing clubs, visual comedy, and spoken comedy in French, delivered with a winning American accent—was spotted by an usher of the legendary Casino de Paris revue theater. They were invited to audition at the Casino for Roland Petit's show, Zizi, je t'aime! To their own surprise, they were hired. They subsequently performed the act on French television, which is how Annie Fratellini first saw them. This was 1975. Annie Fratellini had just opened a circus school in Paris and was well on her way to launching her own circus, the Nouveau Cirque de Paris. She offered Paul and Michael the opportunity to join her and her company. This was an eye-opening experience for the Americans. Paul discovered a circus vastly different from what he had been exposed to in his childhood with the annual visits of Ringling Bros. And Barnum & Bailey at Madison Square Garden—which had never left a lasting impression on him. Here was an intimate, one-ring circus, where unparalleled artistry and keen attention to detail were paramount—a far cry from the traditional American circus's razzle-dazzle. Paul came to view the circus as an art form, and he was hooked. He returned to New York with one idea: creating that kind of circus in his hometown. Michael jumped onboard, they found people to implement this apparently wild idea—notably the Big Apple Circus's founding chairman, Alan B. Slifka) and at the end of 1976, the New York School for Circus Arts, Inc. was born. Its performing arm, the Big Apple Circus, opened its doors a few months later, on July 18, 1977, in a small green tent planted on a landfill that would later become Battery Park City. Paul Binder has been the Big Apple Circus's artistic director from its inception up to his retirement from the ring in 2008. He directed each of its annual productions until 1996. He worked as an augusteIn a classic European clown team, the comic, red-nosed character, as opposed to the elegant, whiteface Clown. 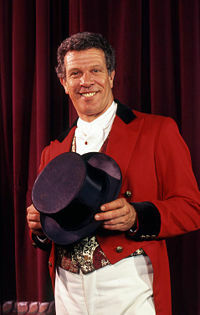 in the early shows until 1982, and he and Michael performed their juggling act in every edition of the Big Apple Circus until 1983—and once more in 1985, in a performance of the Big Apple Circus with the Boston Pops Esplanade Orchestra for a PBS TV special, The Pops Join the Circus. They did their juggling act for the last time on January 27, 1998 in Paris, for a tribute to Annie Fratellini at the Festival Mondial du Cirque de Demain. After his retirement from active duty at the Big Apple Circus in December 2008 (he was succeeded as Artistic Director by Guillaume Dufresnoy), Paul has continued to serve on its the Board of Directors, where he has been active as artistic consultant and fund raiser. He also made guest appearances in circus-related events, including acting as Ringmaster for Circus Sarasota in January 2013. That same year, he published a book of souvenirs from his life in the circus, Never Quote The Weather To A Sea Lion. In 1985, Paul married Swedish equestrienneA female equestrian, or horse trainer, horse presenter, or acrobat on horseback. Katja Schumann; together they had two children, Katherine Rose (b.1985) and Max Abraham (b.1987). They separated in 2004. Paul has two other children from previous unions, Anais and Adam. Paul Binder has received Honorary Doctorate Degrees in Fine Arts from Dartmouth College, the Pratt Institute, and Rhode Island College, and an Honorary Doctorate of Human Letters from Long Island University. He has been designated a New York Living Landmark by the New York Landmark Conservancy. Starting in 1980, he has frequently acted as a Judge at the Festival Mondial du Cirque de Demain in Paris (and most recently in 2009), and he sat on the Jury of the International Circus Festival of Monte-Carlo in 1994 and 2005. In 2009, he was inducted into the Circus Hall of Fame in Peru, Indiana, and the following year, the Circus Fans Association of America renamed its Felix Adler Tent #12, the "Felix Adler-Paul Binder Tent #12".